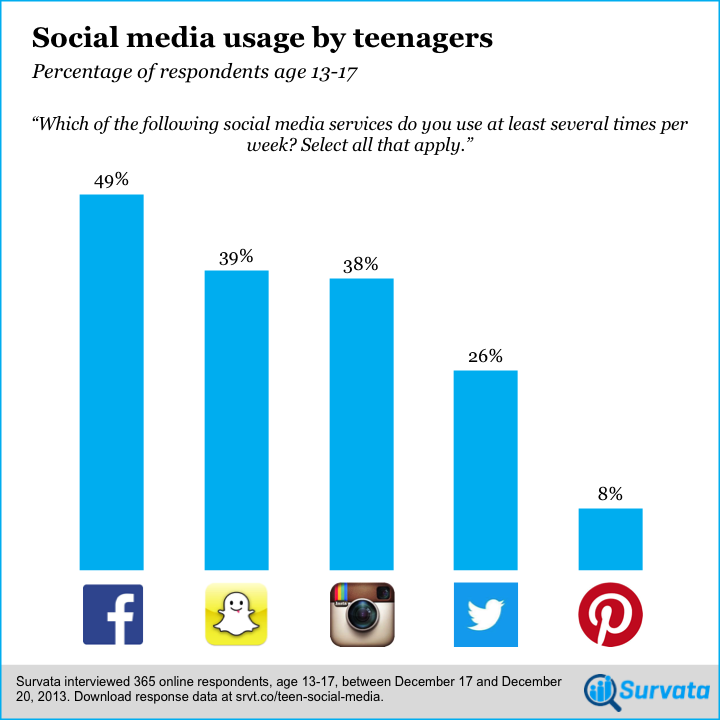 In early 2013, I posted results from Survata that indicated that teens really did use Snapchat, Instagram and Tumblr. About one year later, Survata ran the survey again, and this is what they found. A year ago, only 13% of teens used Snapchat at least several times a week. That has since increased to an incredible 39% as of January 2014. These are very impressive numbers alongside social media stalwarts Facebook, Instagram, and Twitter. I've heard some Valley insiders note that the growth and traction numbers for Snapchat would justify valuations of upwards of $20B if you used comparable metrics from valuations of Asia-based messaging services like Line. The attention economy continues to evolve, and not all the spots on the social media periodic table have been filled quite yet. An upstart with a unique model that taps real user behavior can still gain traction in an incredibly fast rate. As a side note, YC-backed Survata remains a really valuable tool to gain insights and run surveys against lots of Internet users quickly. See the full methodology for their teen social media study here.